The volume of a cylindrical object is Pi (π) times the radius squared, times the height. So if your radius is “z” and your height is “a” you get: πz^2a or Pi(z*z)a. See? 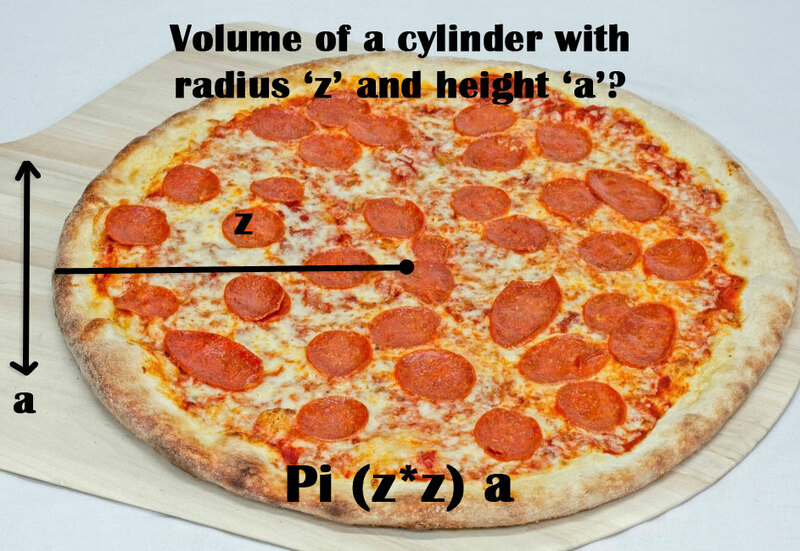 a little math never hurt anyone, especially when its pizza-centric math. Someone please look into why we aren’t introducing more pizzas into math classrooms everywhere. Come visit Pop Up Pizza for a slice of the best pizza Las Vegas has to offer. You can also call us at (702) 366-0049 to place an order for delivery, or place your order online. We can’t promise that it will make you better at math, but we promise it’s delicious.